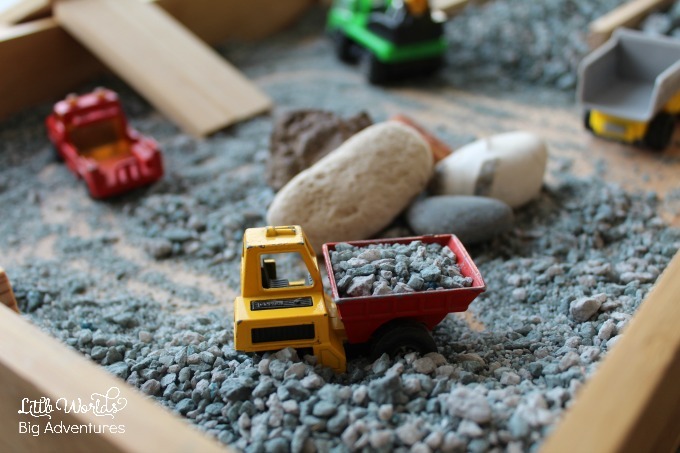 If you can not walk, ride or drive past a digger without squeals and pleads to stop and watch for hours, this simple stone quarry small world is for you. 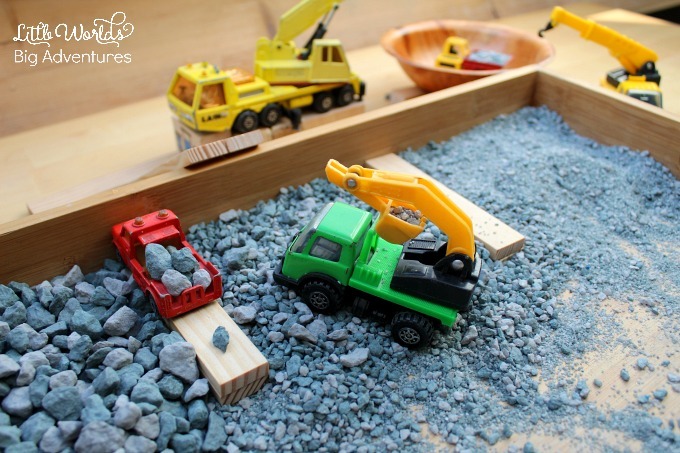 Read along and see how you can put together a pretty amazing invitation to play and explore construction vehicles and rocks. Lots of rocks. Enjoy! My oldest son, now almost five years old, has been obsessed with all things truck and digger since he was about two. Then one weekend we found ourselves driving past a stone quarry and his little eyes nearly fell out of their sockets. The sheer size of the quarry, the busy to and from driving from all kinds of heavy construction vehicles sure had its impact on the little boy. 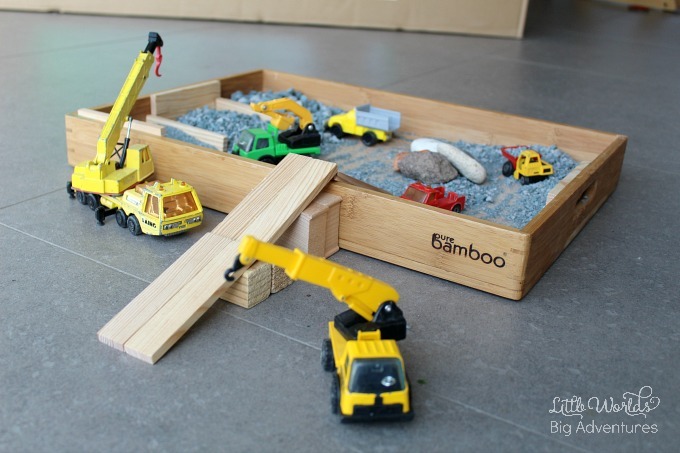 It was years later that my mother in law got out a box with vintage construction vehicles my husband used to play with, which made me think of that stone quarry. So I decided to go and search for some materials and inspiration to set up our very own stone quarry small world. 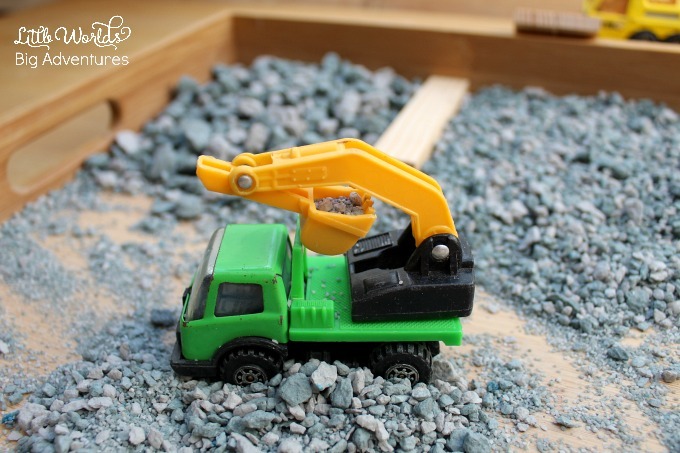 The trick is to use what you have available to you so have a look around your house for trays or tubs, trucks and diggers. And feel free to get creative in using other things as rocks if you feel it’s not safe for your kids to use. Everything is possible! 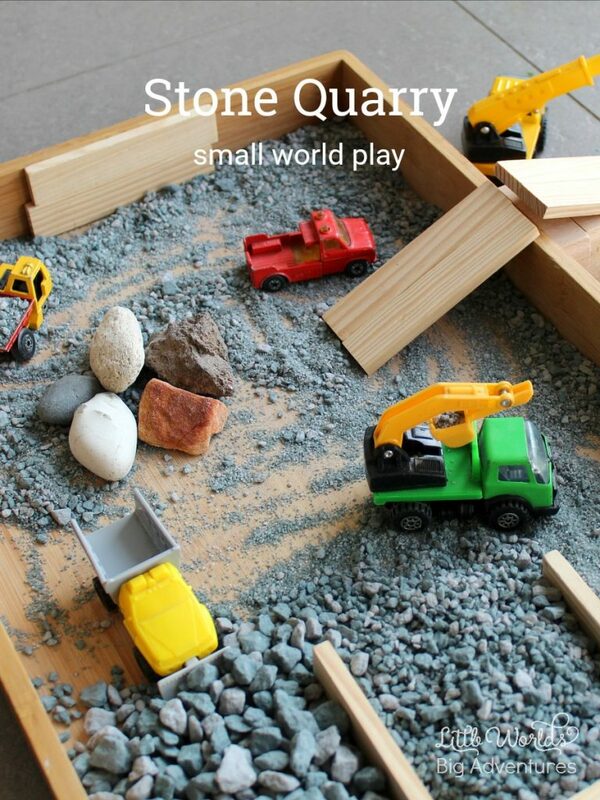 How to play with the Stone Quarry Small World? It’s a simple but very clever question I get all the time. A lot of parents will tell me their kids get bored, or destroy the tray within minutes. (I’m all too familiar with that!) Here are a couple of pointers that will help you get the most out of your set up. All kids are different and every stage of development can feel like an alternate universe at times, so trust your own instincts and judgement to take from activities like these the things you like and think will work for you as well as they did for me. But wait … there is more! 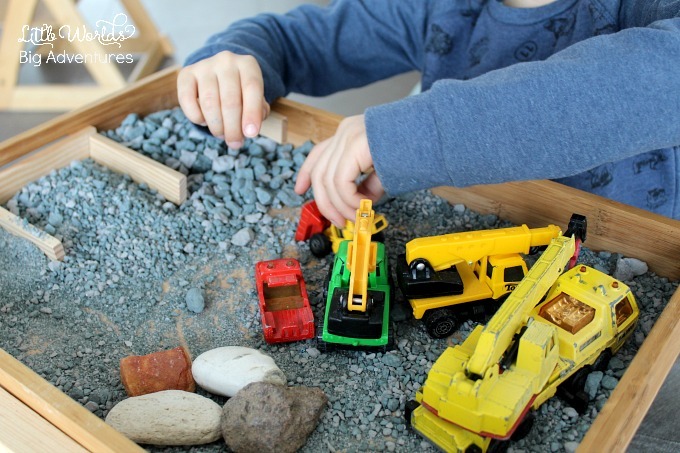 Should you like to read more about small world play, what it’s all about, benefits for child development and how to get started, this beginner’s guide to small world play is a must read. Then I also wrote an extensive article about encouraging creativity in young children and put together this list of simple invitations to play an a tray of which I’m SURE there will be plenty of ideas you’ll absolutely love! Thanks for your time and hope you enjoyed reading this! « 15 Creative Perler Beads Projects to try today!